Buying fish used to be easy. You'd go to the seafood store, look in the case, select your fish, and go home to cook. Nowadays, it's a lot more complicated. If you're pregnant, you need to avoid mercury-rich fish; farm-raised fish are good, except for when they're bad; some species which are endangered still show up on the menus of restaurants. All of this leads to confusion and often frustration on the part of many consumers. What should you do? Visit the Monterey Bay Aquarium Seafood Watch website. The Seafood Watch program "helps consumers and businesses make healthy choices for healthy oceans" by guiding you through these murky waters. The folks at Seafood Watch share their "seafood recommendations" which are organized by geographic region, teach you about pressing ocean issues, provide sustainable seafood recipes, and even show you how to get involved in the cause. Best of all, you can acquire an app that will help you when you're in the market shopping for fish. Another way to make sure you're buying sustainable fish is to know your fishmonger. Mine is Tommy Gomes of Catalina Offshore Products in San Diego, a friendly, funny idiot savant of fish. Not only does Catalina offer the freshest of local fish, but they also run Collaboration Kitchen, a program in conjunction with Specialty Produce, that offers once-a-month demos and a 5- to 7-course tasting meal led by local chefs. Proceeds go to support the Monarch School for homeless and at-risk youth. Last week when Tommy announced on Facebook that fresh halibut fillets were on sale for $9.85 a pound, I practically tripped over myself to order 2 pounds worth. Halibut is a firm, mild-tasting, white fish that pairs deliciously with a wide variety of salsas and chutneys. I made baked halibut with a zesty mango, corn, and cucumber salsa for the first pound. The second pound was transformed into these healthy baked tacos with a sweet-and-spicy pineapple-tomatillo salsa. Because fish tacos just make life better. Tomatillos. Remove the papery husk, and wash the tomatillo before using. This healthier version of fish tacos is low in fat, cholesterol, and calories but not on flavor. 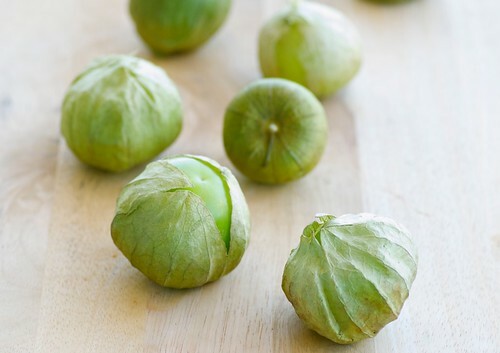 Tomatillos, sometimes called Mexican green tomatoes, look like small green tomatos wrapped in a papery husk. They have a distinctive tart, citrusy flavor that balances the sweetness of pineapple in this salsa. They're available at Mexican specialty markets as well as most major supermarkets. 1. Preheat oven to 400 degrees F. Place egg whites in a shallow bowl and lightly beat with a fork. In another shallow bowl, place cornmeal seasoned with salt and pepper. 2. Pat fish dry with paper towel. Dip each piece of fish in the egg whites then dredge in the cornmeal. Place on a parchment paper-lined baking sheet or baking dish coated with cooking spray. Bake for about 20 minutes, turning once mid-way through. The fish will be cooked when the cornmeal becomes golden and crunchy and the fish is opaque when pierced with a fork. 3. For the salsa, heat oil in a large skillet over medium-high heat. Add onions and cook for 5 to 7 minutes until browned and translucent. Add tomatillos and cook 5 minutes, until tender and few brown spots appear. Add pineapple and jalapeno and cook for 2 minutes. Add lemon zest and juice, salt, and cilantro, and stir well. Remove from heat. 4. To assemble tacos, heat tortillas on a dry griddle over medium heat for 1 minute per side or, using metal tongs, simply hold over an open flame until warmed and slightly charred. 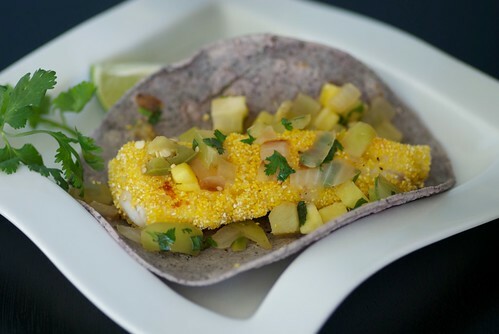 Place a layer of salsa on each tortilla, then a fish fillet, then another dollop of salsa and fresh chopped cilantro. Serve immediately. Congratulations, cassiecramer! You are the winner of Alice's Cook Book from last week's give-away. Thank you to everyone who participated. There will be many more give-aways to come! thanks for the shout-out to Seafood Watch. Fish is complicated but I actually find it a LOT less complicated to navigate than beef or chicken. I've been seeing fish tacos everywhere lately and it's making me want them more and more! These look great. I just posted fish tacos on my site, first time I made them, they are not an east coast thing, but we loved them! I love your healthy version. Bravo for the shout-out to Seafood Watch! I love halibut and these look great. I'm jealous of all the wonderful ingredients you have and find! I may not be able to get the fresh halibut, but I think I can get my hands on some tomatillos. I love the salsa idea. I'm not the biggest fish fan, but I do love a well dressed fish taco. I bet I could even convince my nonfish-eating boyfriend to try these with the salsa. The dishes complimented each other perfectly. My family loved it! Oh, oh oh how I love the smell of those small divine little tomatoes... (tomitio) sp) ? when they are boiling, cooking... They remind me a little of the scent that comes from an apple. This is the best fish taco ever! I love halibut and wish that we could get it reasonably priced here, but I uaually have to settle for frozen. I love this version of fish tacos that are not fried.